Ashbury Soprano Ukulele, Flamed Oak Flame oak top, back and sides. Satin finish. Aquila strings. Ashbury Soprano Ukulele, Mango Wood Mango wood top, back and sides. Hardwood fingerboard and bridge..
Ashbury Soprano Ukulele, Black Walnut Black walnut top, back and sides. Maple fingerboard and bridge. Ashbury Soprano Ukulele, Spruce Top Spruce top, sapele back and sides. Hardwood fingerboard and bridge. 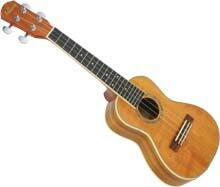 Ashbury Lonely Player Travel Ukulele Small travel sized headless ukulele with soprano scale length. Ashbury Concert Ukulele, Ash Body Ash top, back and sides, bound fingerboard, geared tuners. Aquila strings. Ashbury Concert Ukulele, Flamed Oak Flame oak top, back and sides. Satin finish. Aquila strings. Ashbury Concert Uke, Electro Acoustic Cutaway with Fishman Kula uke pickup. Flame oak top, back and sides. Ashbury Concert Ukulele, Solid Sapele Solid saplele top, back and sides. Slightly larger body size. Ashbury Concert Resonator Ukulele, Wood Wooden body Concert Uke with single resonator cone..
Ashbury Tenor Ukulele, Electro Acoustic Cutaway with Fishman Kula uke pickup. Flame oak top, back and sides. Ashbury Tenor Ukulele With Cutaway Fishman Isys Uke pick-up and EQ unti. All solid sapele top back and sides. Ashbury Tenor Resonator Ukulele, Wood Wooden bodied Tenor Uke with single resonator cone..